The 2008 K2 disaster occurred on 1 August 2008, when 11 mountaineers from international expeditions died on K2, the second-highest mountain on Earth. Three others were seriously injured. The series of deaths, over the course of the Friday ascent and Saturday descent, was the worst single accident in the history of K2 mountaineering. Some of the specific details remain uncertain, with different plausible scenarios having been given about different climbers' timing and actions, when reported later via survivors' eyewitness accounts or via radio communications of climbers who died (sometimes minutes) later in the course of events on K2 that day. 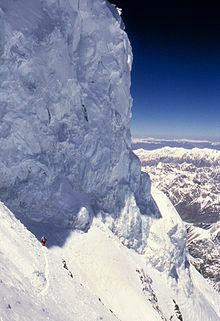 The main problem was reported as an ice avalanche occurring at an area known as "The Bottleneck", which destroyed many of the climbers' rope lines. However, two climbers died on the way up to the top prior to the avalanche. Among the dead were people from France, Ireland, Korea, Nepal, Norway, Pakistan, and Serbia. K2 is the second-highest mountain on Earth, after Mount Everest, with a peak elevation of 8,611 metres (28,251 ft). K2 is part of the Karakoram range, not far from the Himalayas, and is located on the border between the Pakistani Gilgit-Baltistan region, and China's Taxkorgan Tajik Autonomous County of Xinjiang Autonomous Region. It is regarded by mountaineers as far more challenging than Everest, and is statistically the second most dangerous mountain in the world in terms of fatality per summit. The most dangerous section of the climb is the Bottleneck, a steep couloir overhung by seracs from the ice field east of the summit. The high risk of falling ice and avalanches means climbers aim to minimize time spent there. This section would prove especially deadly on this day. The climbing season at K2 lasts from June to August, but in 2008 adverse weather prevented any groups from summitting during June and July. At the end of July, ten different groups were waiting for good weather, some of them having waited for almost two months. The months preceding the summit push were used for acclimatization and preparing for the camps higher on the mountain, the highest of them, Camp IV, at 7,800–7,900 m (25,600–25,900 ft) above sea level. With the end of July approaching and weather forecasts indicating improving weather, several groups had arrived at Camp IV on Thursday, 31 July in preparation to try the summit as soon as weather would permit. Members of an American team, a French team, a Norwegian team, a Serbian team, a South Korean team along with their Sherpas from Nepal, an international team sponsored by the Dutch company Norit, and the teams' Pakistani high-altitude porters (HAPs) decided to work together on the Friday 1 August ascent. A few independent climbers (a solo Spaniard and an Italian pair) would also push for the summit in the morning. The HAPs and Sherpas started to prepare fixed lines before midnight. They were joined by Spanish solo climber Alberto Zerain, who had come up from Camp III during the night and decided to continue his summit push early, rather than stay at Camp IV. The most experienced HAP, Jehan Baig, had to go back down with symptoms of high altitude sickness. His experience as the only person in the collected teams to have previously summited K2, and his unofficial leadership of the HAPs and Sherpas, was sorely missed. Some confusion followed and ropes may have been left behind or placed too far down the slope from the Bottleneck. When the climbing groups started upward at 3:00 a.m., they found that the HAPs and Sherpas had started planting lines right above Camp IV, where they were not needed, up into the Bottleneck, and then had run out of rope for the traverse just above the Bottleneck. This forced the climbers to take the rope from the lower portion of the route and use it to prepare the lines above the Bottleneck, causing a dangerous unplanned delay in the climb schedule. At this point, Eric Meyer and Fredrik Sträng of the American group decided to abort the attempt and return to Camp IV, due to both the high probability of reaching the summit late, and the high exposure to ice fall in the crowded Bottleneck. Chris Klinke pushed on for a few more hours before abandoning the ascent, as did Jelle Staleman of the Norit team, who was also suffering frozen feet. At 8:00 a.m., climbers were finally advancing through the Bottleneck. Dren Mandić, from the Serbian team, decided to unclip himself from the fixed rope to attend to his oxygen system and to pass Cecilie Skog of the Norwegian team. He lost his balance and fell, bumping into Skog. She was still clipped to the rope and was merely knocked over. Mandić, however, fell over 100 m (328 feet) down the Bottleneck. Some climbers at Camp IV claimed they could see he was still moving after the fall and sent a group to help recover Mandić. Swede Fredrik Sträng stated he took command of the recovery operation. When Sträng reached the body, Serbian climbers Predrag Zagorac and Iso Planić, along with their HAP Mohammed Hussein, had already arrived. They had found no pulse and, judging by the severity of Mandić's injuries, pronounced him dead. The Serbian climbers decided to lower the body down to Camp IV, and Sträng assisted them. They were joined by Jehan Baig, a HAP from the French team, who had fulfilled his assisting duties and had been allowed to head down. Several people later indicated Baig may have been suffering from high altitude sickness, since he had displayed questionable behaviour in abseiling down the Bottleneck. Sträng also noticed that Baig was incoherent, first offering to help in the rescue, later refusing to help, then returning moments later to assist them again. Baig lost his footing and bumped into Sträng, who then urged him to let go of the rope attached to Mandić's harness, before all four climbers would be dragged down. Baig finally let go of the rope, but to Sträng's and the others' surprise, he did not try to stop his slide by using the self-arrest technique, which has about a 50% chance of arresting a fall, and Baig fell to his death. It is unclear why he did not try to stop his slide. Sträng then decided to descend without Mandić's body. The Serbian group aborted, wrapped Mandić's body in a flag and fastened him to the mountain, and started to descend. Nicholas Rice, a climber with the French team who had been delayed, also aborted at this point. These delays, together with the traffic jam in the Bottleneck, resulted in most climbers' reaching the summit much later than planned, some as late as 8:00 p.m., well outside the typical time for summitting of 3:00 to 5:00 p.m. All together, 18 people summited that day, though eight (plus one who stopped near the summit) would not survive the lengthy descent. On the descent, the Spaniard Alberto Zerain, who had topped out first and alone at 3:00 p.m., managed to pass through the Bottleneck without trouble. By 8:30 p.m., darkness had enveloped K2. Members of the Norwegian group – including Lars Flatø Nessa and Skog, who had both summitted two hours after Zerain – had almost navigated the traverse leading to the Bottleneck, when a serac (a large block of glacial ice) broke off from above. As it fell, it cut all the fixed lines and took with it Skog's husband Rolf Bae, who had abandoned the ascent only 100 m (330 ft) below the summit, telling Nessa to look after his wife, as he waited for her. Nessa and Skog continued descending without the fixed lines, and managed to reach Camp IV during the night. As a result of the serac's fall, the descent through the Bottleneck became more technical. Chunks of ice lay scattered around the route, and the mountaineers above were stranded in darkness in the death zone above 8,000 m (26,000 ft). Since the climbers had planned for the fixed lines, they were not carrying additional ropes or fall protection devices, forcing the climbers to "free solo" the descent through the notorious Bottleneck. According to team Norit's Dutch mountaineer Wilco van Rooijen, panic broke out among the climbers waiting above the Bottleneck. Some tried to descend in the darkness, while others decided to bivouac and wait until morning before descending. The Norit team included a full climbing member named Pemba Gyalje, a Sherpa mountaineer who years earlier had been a support climber on Mount Everest. Gyalje descended in the darkness without fixed ropes to reach Camp IV before midnight. Sherpa Chhiring Dorje also free-soloed the Bottleneck with "Little" Pasang Lama (who had been stranded without an ice axe) secured to his harness. "I can just about imagine how you might pull it off," writes Ed Viesturs in K2: Life and Death on the World's Most Dangerous Mountain. "You kick each foot in solid, plant the axe, then tell the other guy to kick with his own feet and punch holds with his hands. Don't move until he's secure. Still, if Pasang had come off [i.e., 'fallen'], he probably would have taken Chhiring with him. Talk about selfless!" Two members of the South Korean expedition, Kim Jae-soo and Go Mi-Young, also managed to navigate the Bottleneck in the dark, although the latter had to be helped by two Sherpas from the Korean B team, Chhiring Bhote and "Big" Pasang Bhote, who were supposed to summit the next morning. The men had climbed up around midnight without food or oxygen, and found Go Mi-Young stranded somewhere in the Bottleneck, unsure of which route she had to take. They guided her down safely. Meanwhile, team Norit's Cas van de Gevel and the French team's Hugues D’Aubarede had each decided to manoeuvre the Bottleneck in the dark. As Van de Gevel reached the bottom of the Bottleneck, he witnessed a climber falling to his death, a story corroborated by the two Sherpas Chhiring Bhote and "Big" Pasang Bhote, who also had witnessed one or two objects falling from the mountain. This climber was probably D'Aubarede, whom van de Gevel had passed just above the Bottleneck in the dark. D'Aubarede had run out of bottled oxygen hours before, and when van de Gevel had passed him, he had looked tired and insisted van de Gevel descend before him. Italian semi-soloist Marco Confortola and Norit teammates van Rooijen and Irishman Ger McDonnell bivouacked above the traverse, as they could not find the fixed ropes leading across the traverse. Confortola claimed that during the bivouac, he heard screams and saw headlights disappear below him after a roaring sound came from the serac field. At that point, eight people were still above the Bottleneck. The rescue efforts started in the base camp as a group was sent upwards with ropes to help those still stuck in the Bottleneck. The group included Sherpas Tsering Bhote and "Big" Pasang Bhote, who had previously helped Go Mi-Young down the Bottleneck; they now went to search for their relative Jumik Bhote, who had been stranded with the remaining climbers of the Korean expedition somewhere above the Bottleneck. Early in the morning, above the traverse, van Rooijen gave up the search for the fixed ropes and descended alone. His vision was deteriorating and he feared he was going snow blind, requiring him to get off the mountain quickly. Confortola and McDonnell did not follow him immediately. Later, van Rooijen reached the remaining Korean climbers (Confortola claims one of them was Kyeong-Hyo Park) and their guide Jumik Bhote. The men were tangled in several ropes and had clearly been hanging there, some upside down and bloodied, through the night, but all alive. It is unclear whether or not the men were the victims of a second serac fall, an avalanche, or perhaps a regular fall leaving them tangled in the ropes. Some sources mention only two Koreans and Jumik Bhote, while other reports indicate three remaining Koreans (one near death). It could be that this was the event Confortola had witnessed during the bivouac the previous night, while it could also be that this was the second object Tsering Bhote and "Big" Pasang Bhote saw falling off the mountain—there is little direct evidence to clearly confirm either possibility. Van Rooijen handed Jumik Bhote his spare pair of gloves but was unable to help them any more. He claims Jumik Bhote informed him a rescue mission was under way from Camp IV. Van Rooijen decided to continue descending. Confortola and McDonnell reached the Korean group later in the morning and worked for several hours trying to free them. It is unclear what happened next. Confortola claims McDonnell, after working with Confortola for at least 1.5 hours, suddenly climbed back up the mountain, leaving him with the three stranded men. Confortola assumed McDonnell had succumbed to high-altitude sickness and was growing delusional, believing he had to climb back up. Left alone, Confortola did all he could for Jumik Bhote, giving him his own equipment. They had managed to get the Koreans back into at least a comfortable position, though they were still entangled. Confortola says he was able to radio Tsering Bhote and "Big" Pasang Bhote, who were on their way up to rescue the men. Confortola, having spent at least three hours with the entangled men, was exhausted and chose to continue down. Van Rooijen disputes Confortola's version of the events. Van Rooijen, who had seen Confortola and McDonnell helping the stranded Koreans and their guide from below, thinks McDonnell did not climb back up the mountain, but rather climbed up to the highest anchor supporting the three stranded men to try to transfer the load. He then could have returned to the three men and may have spent another several hours alone helping free the men from the ropes. In his book Surviving K2, van Rooijen provides some photographs he believes supports these claims. Confortola stated that some time after he left the three men, an avalanche struck just feet away from him. In the rubble of this avalanche, he spotted the remains of one climber. After investigating them, he suggests these were McDonnell's remains. Just after noon, Tsering Bhote and "Big" Pasang Bhote had reached the bottom of the Bottleneck. There they found Confortola crawling on his hands and knees. The two Sherpas radioed Gyalje and van de Gevel to come up for Confortola, so Tsering Bhote and "Big" Pasang Bhote could continue the search for their relative Jumik Bhote and the Koreans. "Big" Pasang Bhote later radioed Gyalje that he had met Jumik Bhote and two members of the Korean expedition just above the Bottleneck—apparently they were freed after all. He also radioed that a fourth climber, descending behind the two Koreans and the two Sherpas, had been swept away by a serac fall and was dead. The description of the climber's red-and-black suit matched McDonnell's, which suggests Confortola was mistaken in identifying the remains in the avalanche as McDonnell's and supports van Rooijen's theory that McDonnell freed the two Koreans and Jumik Bhote, before perishing in a different serac fall. Tsering Bhote, from his position at the base of the Bottleneck, has also claimed to have seen a serac fall strike the rescue party as they were descending near the top of the Bottleneck. Here, another mystery of the 2008 K2 disaster adds confusion to the sequence of events. There was one other climber still unaccounted for: D’Aubarede's HAP, Meherban Karim. Karim was last seen returning from the summit with D’Aubarede, in the later hours of 1 August. He and D’Aubarede must have gotten separated in the dark, as van de Gevel encountered only D’Aubarede above the Bottleneck. Van Rooijen, in his book Surviving K2, supports the theory that Karim bivouacked even higher on the mountain than van Rooijen, Confortola, and McDonnell. Again, van Rooijen provides photographic evidence: what looks like a climber can be seen above the serac field on the morning of 2 August. In a later photo, the figure seems to have disappeared, and there is a trail leading down the seracs. Van Rooijen and others, such as McDonnell's partner Annie Starkey, believe this figure was Karim. Disoriented from spending the night at such high altitudes without an oxygen mask, he might have gotten lost and stumbled onto the serac field, where he fell or got swept away by an avalanche or part of the breaking serac. He might even have actually caused one of the serac falls. Hence, it may have been Karim's remains Confortola had found earlier in the avalanche rubble. Graham Bowley, in his book No Way Down (2010), is unable to refute the evidence presented by van Rooijen but still deems the photos inconclusive at best. He is joined in his analysis by writer Michael Kodas. Both men edge towards the testimony of the only living eyewitness: Marco Confortola. In the photos taken by Gyalje, individual climbers cannot be made out. In fact, some of the figures assumed to be climbers could very well be rocks, and marks that look like trails are everywhere on the mountain. Another possible explanation of the mystery is an error in "Big" Pasang Bhote's observations about the colour of the suit, meaning the last climber could have been Karim, who was wearing a pure red down suit. If so, Confortola had indeed identified McDonnell's remains in the avalanche earlier. The existence of multiple plausible scenarios underscores the uncertainty, even among eyewitnesses, pertaining to the course of events on K2 that day. In the book Buried in the Sky (2012), Amanda Padoan and Peter Zuckerman examine much more closely the Sherpa and HAP experiences of the 2008 disaster, and present plausible alternative scenarios and explanations of the events, including the possibility that McDonnell and Karim were still alive at the time of the fourth serac fall. Minutes after "Big" Pasang Bhote had radioed in the news that he had found his relative Jumik Bhote and two Koreans, another avalanche or serac fall struck. It swept away the four men. Tsering Bhote, who had climbed more slowly than fellow rescuer "Big" Pasang Bhote, had not yet reached the top of the Bottleneck. Consequently, he survived the avalanche, as did Gyalje and Confortola at the bottom of the Bottleneck. The death toll had now risen to 11. Meanwhile, van Rooijen was making his way down the mountain alone. He had climbed down a new route to the left of the Česen route, bypassing Camp IV. Van de Gevel and Gyalje descended from Camp IV to Camp III after they had heard van Rooijen was still somewhere on the mountain. Van Rooijen had managed several satellite phone calls that may have helped pinpoint his location. He would ultimately have to spend a second bivouac out on the mountain, suffering third-degree frostbite to his feet. Wilco van Rooijen is one of only a few people to survive two days above the 8000m "Death Zone". On Saturday, Van de Gevel and Gyalje made contact with van Rooijen on the Česen route early in the morning; the three managed to get down to the base camp at 10:00 p.m. The next day, Van de Gevel and van Rooijen were evacuated from base camp by helicopter, to Skardu. Confortola reached Camp II, the advance base camp. Pakistani authorities released a list of names of those killed and injured. Confortola was evacuated by helicopter the following day. The Pakistani military started a rescue operation early on 4 August 2008, using two helicopters. They rescued two injured and frostbitten Dutch climbers from the base camp, located approximately 5,000 metres (16,400 ft) above sea level. Four climbers, including an Italian, were making their own way down the mountain. The four were flown to Skardu for treatment. Van Rooijen was found using GPS coordinates sent out by his Thuraya satellite phone when he used it to call his brother. Ger McDonnell's family established a charity to sponsor the children of four HAPs who died on K2. Chhiring Dorje Sherpa and "Little" Pasang Lama's intersecting lives were profiled in Buried in the Sky (2012). The book won the National Outdoor Book Award (history/biography), the 2012 NCTE George Orwell award, the Banff Mountain Book Festival's Mountaineering History Award. Chhiring Dorje Sherpa was honoured for his heroism with the Tenzing Norgay Award at the Explorers Club Annual Banquet in March 2013. Pemba Gyalje Sherpa was named the 2008 National Geographic Adventure Adventurer of the Year, for "extreme heroism under trying extreme circumstances". Ed Viesturs published K2: Life and Death on the World's Most Dangerous Mountain (2009) and has participated in numerous other media projects related to the experience. One of the three Korean casualties perished either during the incident that caused their original fall and tangled the ropes, or the morning after before the others were freed. Some sources claim there were three Koreans tangled in the ropes, whilst McDonnell and Confortola were trying to rescue them. Others have the number at two Koreans and Jumik Bhote. What is certain is: only two Koreans were alive to encounter Pasang Bhote before the last serac fall. There were no summits in 2009 and 2010, during which season the renowned skier Fredrik Ericsson fell to his death in the Bottleneck. K2's summit was not reached again until 23 August 2011, when Gerlinde Kaltenbrunner (Austria), Maxut Zhumayev and Vassiliy Pivtsov (Kazakhstan), and Darek Zaluski (Poland) topped out via the North Pillar. According to AdventureStats, the last 17 fatalities on K2 have all occurred in, around, or above the Bottleneck, once again proving the deadly nature of K2's upper slopes. ^ a b "K2 2008: List of climbers who passed away released". everestnews.com. Archived from the original on July 7, 2009. Retrieved 2008-08-04. ^ "Eleven climbers feared dead on K2". BBC News. 2008-08-03. Archived from the original on February 17, 2009. Retrieved 2008-08-06. ^ a b c "'Just Pure Stupidity': Eleven Climbers Die in K2 Disaster". Spiegel Online. 2008-08-04. Retrieved 2018-01-24. ^ Taylor, Jerome (5 August 2008). "The Big Question: What makes K2 the most perilous challenge a mountaineer can face?". London: The Independent. Archived from the original on 18 August 2008. Retrieved 2008-08-07. ^ a b Power, Matthew (November 2008). "K2: The Killing Peak". Men's Journal LLC. Archived from the original on 2014-01-09. Retrieved May 16, 2014. ^ "Day Sixty-three: SUMMIT PUSH- Summit Day; Tragedy Begins". www.nickrice.us. Archived from the original on 28 August 2008. Retrieved 7 August 2008. ^ "Death on K2". The Billings Gazette. Retrieved 2015-11-17. ^ a b "Nicholas Rice: K2 and Broad Peak Dispatch". www.nickrice.us. Retrieved 2015-11-17. ^ "Death or glory: The truth about K2". The Independent. Retrieved 2015-11-17. ^ "A Few False Moves". Outside Online. Retrieved 2015-11-17. ^ "K2 report: Missing summit pics and no world records - turning the tables on Fredrik Strang". K2Climb. August 6, 2008. Archived from the original on 2008-08-07. Retrieved 2008-08-07. ^ "K2: Fredrik Sträng's tale of Pakistani guide's fatal fall". k2climb.net. Archived from the original on 2008-08-06. Retrieved 7 August 2008. ^ "Skog's statements during the film". The Summit. 2008. ^ "K2 climber missing after ice fall". bbc.co.uk. 2008-08-02. Archived from the original on 3 August 2008. Retrieved 2008-08-06. ^ "INTERVIEW-K2 survivor recounts fatal mistakes, numbed panic". Reuters. August 4, 2008. Archived from the original on 28 August 2008. Retrieved 7 August 2008. ^ Wilco van Rooijen. Surviving K2. ASIN B007TKATSM. ^ Wilkinson, Freddie (2010). One Mountain Thousand Summits: The Untold Story of Tragedy and True Heroism on K2. New Amer Library. pp. 320, 332. ^ Bowley, Graham (2010). No Way Down. ^ Leger, C. J. (2018-02-12). "The 2008 K2 Disaster". Base Camp Magazine. Retrieved 2019-03-09. ^ "K2 Survivor Wilco van Rooijen, In His Own Words". Beyond the Edge. Retrieved 2015-11-18. ^ Nizza, Mike (August 5, 2008). "Tales of Chaos and Survival on K2". New York Times. Retrieved April 22, 2010. ^ "Day Sixty-six: SUMMIT PUSH– The Final Cost". www.nickrice.us. Archived from the original on 28 August 2008. Retrieved 5 August 2008. 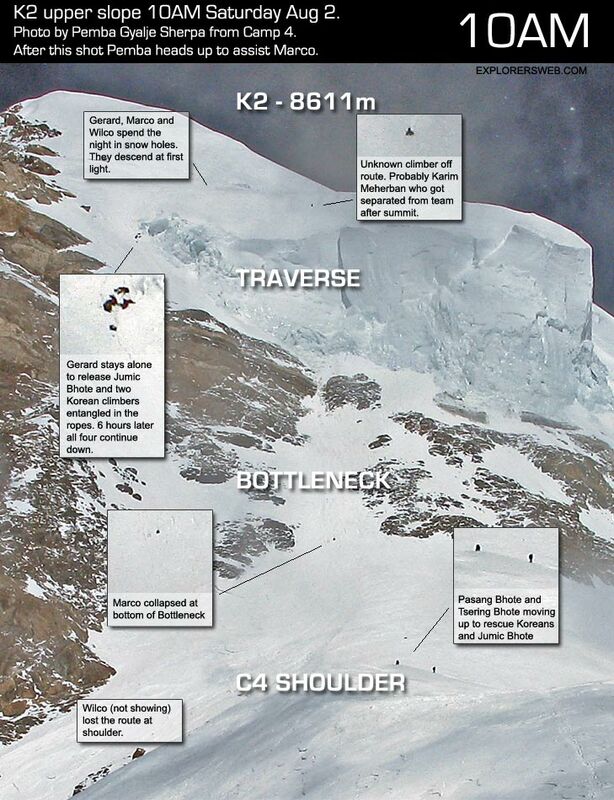 ^ "K2 2008: List of climbers who died released". www.everestnews.com. Archived from the original on July 7, 2009. Retrieved 4 August 2008. ^ "Day Sixty-eight: Wait for Porters Continues; Italians Evacuated". www.nickrice.us. Archived from the original on 28 August 2008. Retrieved 7 August 2008. ^ Perlez, Jane (August 5, 2008). "More Are Feared Dead Near K2's Harsh Summit". The New York Times. Retrieved April 22, 2010. ^ "Death toll in climbing accident on K2 rises to 11". International Herald Tribune. 4 August 2008. Archived from the original on 2008-08-08. ^ "XSAT USA plays role in recent K2 mountain rescue". XSAT USA. 14 August 2008. Retrieved 2014-01-15. ^ Murphy, Claire (6 May 2010). "Scholarship memorial to Gerard -- the hero of K2". The Herald (Ireland). Retrieved 31 December 2017. ^ Zuckerman, Peter & Padoan, Amanda. Buried in the Sky: The Extraordinary Story of the Sherpa Climbers on K2's Deadliest Day. ^ "Chhiring Dorje Sherpa". The Explorers Club. Retrieved 31 December 2017. ^ "Best of Adventure: Adventurers of the Year - They Did It (Fourteen people who dreamed big, pushed their limits, and made our year)". National Geographic Adventure. December 2008. ^ DeBenedetti, Christian (December 2008). "K2 Hero is Adventurer of the Year". The Savior and the Storm. ^ Lederman, Marsha (October 24, 2013). "90 hours in the 'death zone': One man's brave actions on an uncompromising mountain". The Globe and Mail. ^ Skorbach, Kristina Skorbach (October 8, 2013). "Spirituality Safeguards Adventurer Pemba Gyalje Sherpa, at World's Deadliest Peaks: Mountain climber who summited K2 talks about his experience". Epoch Times. ^ DeBenedetti, Christian (December 2008). "Best of Adventure: Adventurers of the Year - The savior and the storm on K2; Heroism: Pemba Gyalje Sherpa". National Geographic Adventure. ^ Rhinofly. "Expeditienet". Archived from the original on 2009-05-28. Retrieved 2009-05-25. ^ a b c "K2 Fatalities". advensturestats.com. Retrieved 2014-01-15. ^ "Fredrik Ericsson, fatal accident on K2". planetmountain.com. 9 August 2010. Retrieved 2016-04-09. Bowley, Graham (2010). No way down : life and death on K2 (1st ed.). New York: HarperCollins. ISBN 978-0-06-183478-3. Archived from the original on 2014-01-16. Retrieved 2014-01-15. Curran, Jim (1995). K2: The Story of the Savage Mountain. Hodder & Stoughton. ISBN 978-0-340-66007-2. Falvey, Pat; Pemba, Gyalje Sherpa (2013). The Summit: How Triumph Turned To Tragedy on K2's Deadliest Days. Dublin: Beyond Endurance Publishing & The O'Brien Press. ISBN 978-1-84717-643-1. Archived from the original on 2016-11-04. Retrieved 2018-09-16. Padoan, Amanda; Zuckerman, Peter (2012). Buried in the Sky: The Extraordinary Story of the Sherpa Climbers on K2's Deadliest Day. New York: WW Norton. ISBN 978-039-334-5414. Viesturs, Ed; Roberts, David (2009). K2: Life and Death on the World's Most Dangerous Mountain. New York: Broadway Books. ISBN 978-0-7679-3250-9. Retrieved 2014-01-15. Wilkinson, Freddie (2010). One Mountain Thousand Summits: The Untold Story of Tragedy and True Heroism on K2. New York: New America Library (NAL). ISBN 978-0451231192. Retrieved 2014-03-19. McCarthy, Guy (August 7, 2008). "Death zone blog entry including the picture of the Bottleneck and a line of climbers". Watershed News including picture taken August 1, 2008 by Nicholas Rice, of the Bottleneck and a line of climbers. "Mountain at 10am Aug 1". ExplorersWeb.com. "Photo taken by Sherpa Pemba Gyalje, of the situation around the Bottleneck in the morning of Aug 2". ExplorersWeb.com. "Expedition photographs from the Dutch Norit K2 team". Flickr.